Holidays or no holidays. Cold weather or warm. We all need a little comfort food now and then. They tantalize the taste buds, warm the soul and take us back to a time and place when life was simpler and problems were small. But yikes! Traditional comfort foods are popping with added sugars, calories, sodium and saturated fat. Fortunately, a few healthy hacks turn typical comfort foods into healthy comfort foods. 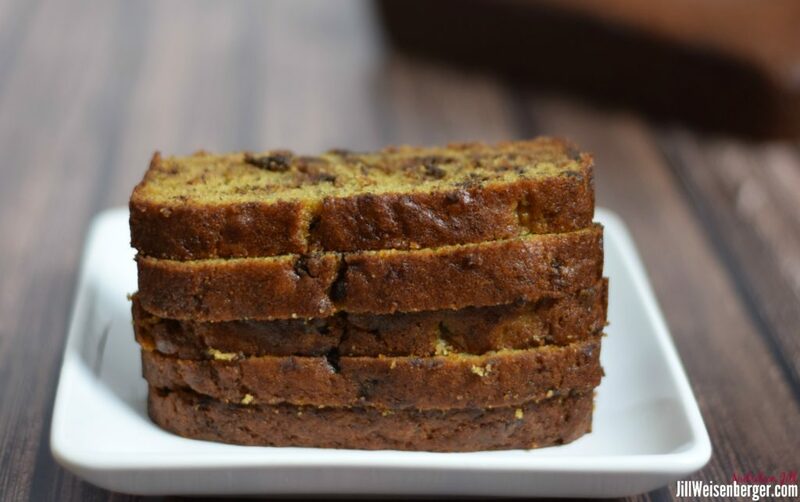 Made with white whole wheat flour and nonfat yogurt, this chocolate chip banana bread is the perfect healthy comfort food. Here’s how to nourish both your soul and your body. Veggie Up! Yes, I say this same type of thing A Lot! I know. It’s because it’s such an important health habit. Some of the best healthy comfort foods are bulked up with nonstarchy vegetables, so you can have a larger portion for fewer calories, carbs, and unhealthy saturated fats – all while boosting nutrition and being extra kind to your gut. Load up pasta salad and every other kind of grain or legume-based salad with cherry tomatoes, sliced carrots, sugar snap peas and more. Add flavor, color and texture when you slip slices of bell pepper, red onion and tomatoes into your grilled cheese sandwich. 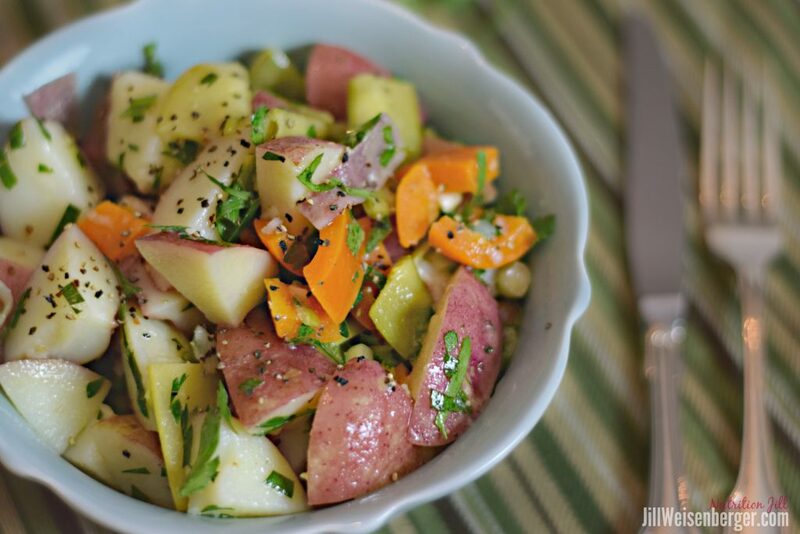 This veggie-packed potato salad was originally published in Diabetes Weight Loss – Week by Week. The cold potatoes have some resistant starch, and the calories per serving are further reduced with the addition of nonstarchy vegetables. Challenge yourself to add a vegetable to all kinds of recipes. It’s a great way to create healthy comfort food. Check out my healthy hashbrown casserole. 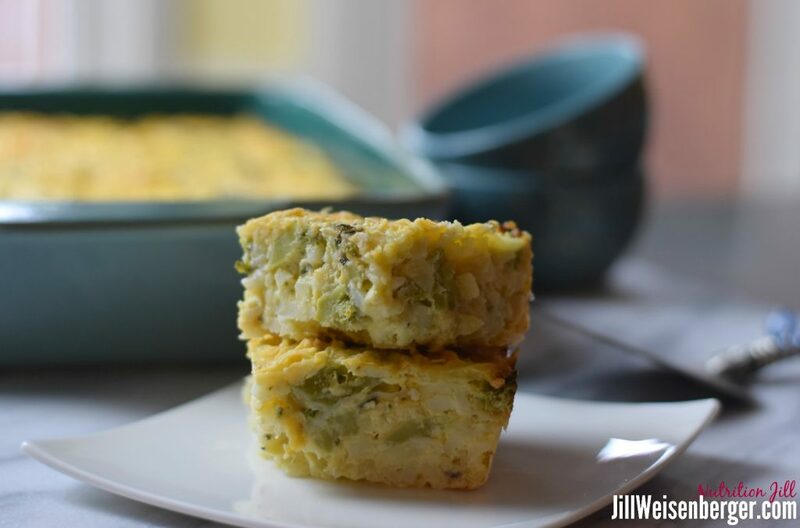 Broccoli was the perfect choice for this healthy hashbrown casserole. Reduced-fat cheese helped lower the calories and the saturated fats. Try hiding vegetables too. Add finely chopped broccoli into tomato-based casseroles and grated carrots into meatloaf. Blend ground meat with finely chopped mushrooms. Check out The Blend, developed and perfected by The Mushroom Council. They’ve got lots and lots of recipes. Focus On Whole Grains. There’s no reason to fear grains, especially whole grains. Diets rich in whole grains are linked to lowered risks of heart disease, type 2 diabetes and colorectal cancer. Choose whole-wheat pasta and couscous, brown and wild rice, oats, barley, quinoa, wheat berries, farro, spelt and others. Oats and barley both contain the viscous fiber beta-glucan, which helps lower cholesterol and improves insulin sensitivity, making both oats and barley excellent choices for people with prediabetes, diabetes or cardiovascular problems. And they are great for healthy comfort food. 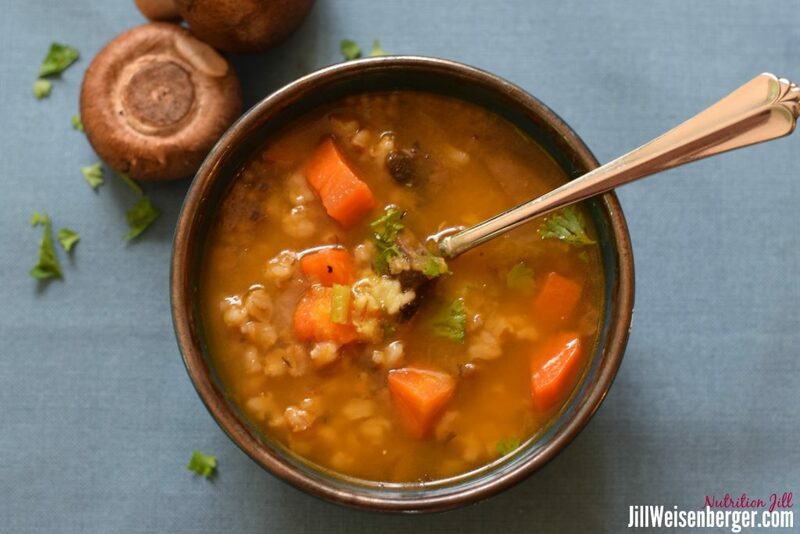 This mushroom barley soup warms the soul and the body. And it helps with insulin resistance and cholesterol levels. Substitute Or Go Halfsies. Sometimes a simple substitution of whole milk to 2% milk or white flour to whole wheat flour turns out beautifully. But other times, it ruins the entire dish. So when it works, go for it. When it doesn’t, go halfsies. For example, make airy blueberry muffins with half white flour and and half whole wheat flour or sprinkle a combination of regular cheese and reduced fat cheese over your pizza. Try some of these partial or full substitutions. Butter or shortening in baked goods Replace 4 tablespoons hard fat with 3 tablespoons canola or olive oil or with 4 tablespoons mashed avocado. Sugar in baked goods Reduce the sugar by ¼ to 1/3 or use a combination of sugar and sugar substitute. 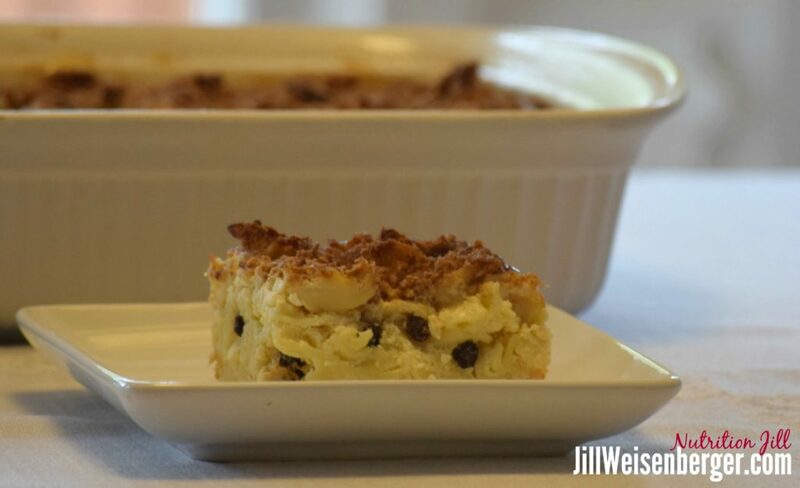 Sweet Noodle Kugel is true comfort food. Check out how I trimmed it down. 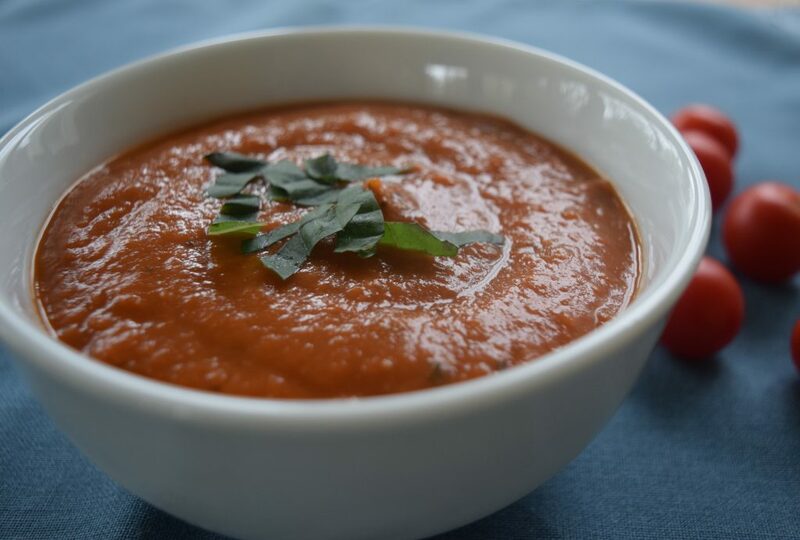 The secret to the “Creamy” Tomato Soup is a bit of pureed bread. Bring Out Flavors. By seasoning smartly and layering flavors, you won’t miss the extra fats, sugars and salt. When cutting back on sugar, season with cinnamon, nutmeg or vanilla to bring out the sweetness of the dish. Sprinkle dry herbs early in cooking and fresh herbs before serving. Check out 5 Mistakes You’re Making with Herbs and Spices. Enhance dishes with toasted nuts. Sprinkle toasted almonds onto green beans, walnuts over Brussels sprouts, pecans into green salads and pine nuts with sautéed spinach. Your options are endless. Use tiny amounts of a strong flavored cheese such as feta or sharp cheddar. Roast or caramelize vegetables to bring out their natural sweetness. Just before serving, squeeze a fresh lemon into stews and soups to use less salt. Downsize. Sometimes nothing but the real deal with satisfy. If that’s the case, go mini. Serve mini sundaes in stylish shot glasses. Bake pudding or tiny cakes in little ramekins. Do the same for chicken potpie and macaroni and cheese. No matter what, sit down, slow down and savor every bite! Cheers to happy, healthy eating! And cheers to healthy comfort food that reminds us of good times!